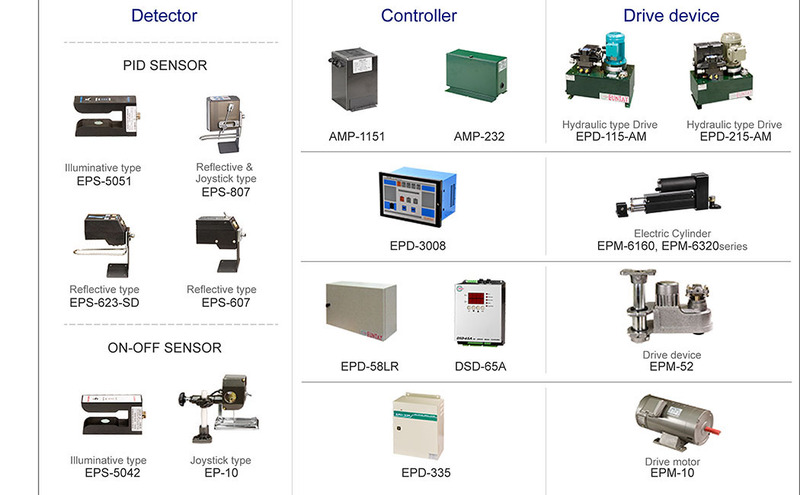 “General purpose Edge Position Control System” is to control material’s edge and let the edge position be the same position in the production process of material; this system has edge position detector with highly adaptive photoelectric edge position detector, digital edge position controller and hydraulic cylinder, suitable for the edge position control of general materials, which are opaque, such as leathers, fabrics and other materials. 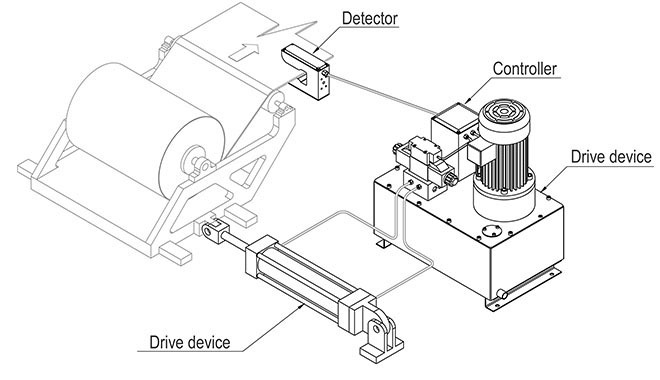 The figure is the configuration diagram of Edge Position Control System in feeding process, the figure shows that the edge position of material is detected by a photoelectric detector, sending edge error detection signal to digital edge position controller, after signal processing, output driving signal to drive device (Hydraulic cylinder is showed in the figure), which moves the material’s frame, and achieve the purpose of edge position control of materials. To demonstrate the application of Edge Position Control System in fabric laminating machine; it makes the edge position of fabric be unchanged in the transportation process and the reel of finished product is flat and solid. To demonstrate the application of Edge Position Control System in fabric stenter machine; it makes the edge position of fabric be unchanged in the transportation process and the reel of finished product is flat and solid.